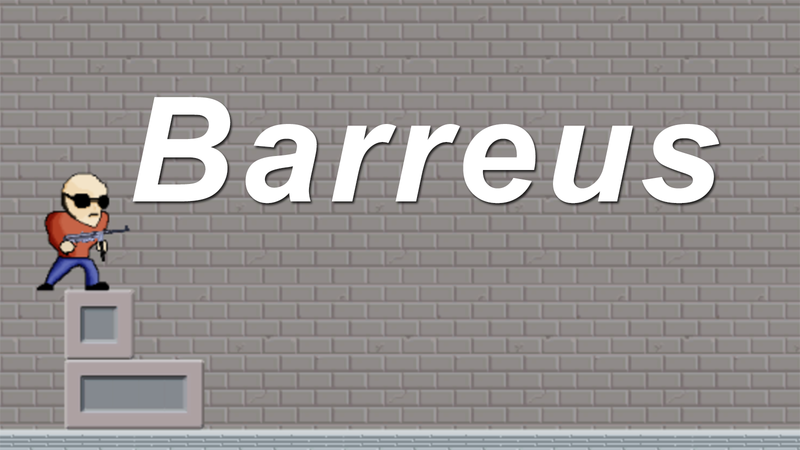 Barreus is a platform-shooter made in 48 hours for the Ludum Dare 40 game jam using Unity 5.6.3p2, Photoshop and Bosca Ceoil. * This build are untested and may not work. My tale of the Ludum Dare 40 project begins with me walking back home from a farewell party of a friend who is going to live in another city, in the cold streets of Barcelona. I looked up through twitter the theme for the jam and my phone’s battery immediately died as if it was some kind of dramatic omen (100% truth). Not being home kind of worked fine for me, as I could start thinking about some ideas for the game: first and lucky thought was the more health, the less powerful. Then I also thought it could be interesting to explore a dynamic where as you gain followers, it would be more difficult to please them but I didn’t know if there was an option easy enough to pursue in the compo (aside from working on a clicker and I really didn’t want to work on a clicker), or doing something with “the more money you have”, “the more energy you have” (throwback to LD39) or “the colder you are” (I was really cold walking back home!). Once home, I was pretty much set on working with the “more health -> less easy” dynamic, so I spent some time thinking about what variables I could play with (damage, speed, vision) and I went to sleep. Actually, the fact that here the jam starts at 3:00 am kind of forces you to spend the first hours on pondering what to do (if you stay awake that late) because I wouldn’t want to start working right away without sleep. It is a dynamic that has worked for me in the past Ludum Dare and in this one. 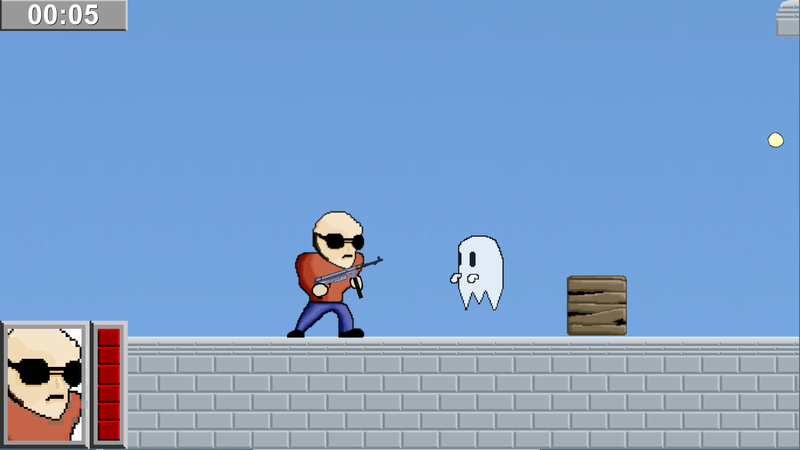 I spent the first day of the jam working on the main character and the controls. I think I spent too much time trying to make him look decent (I am not good at drawing) and, to be honest, I had some problems early on with the responsiveness of my controls which I was able to more or less tune towards the end, but a slight issue with the jump remained (and I am not happy about that). I also was able to work on the character and enemy archetypes quite effectively after having to an emergency refactoring of my code back in LD39. In the end, I was reasonably pleased with the “game feel” having my character shooting non-stop with the gun kickback and the screen-shake (Vlambeer inspired). Before going to bed, I opened Bosca Ceoil and threw some random notes there… About an hour later, I had some background music and truly decided to go to bed. I was destroyed at that point. 4-5 hours later, the alarm tried to wake me up. I set it to 2 hours later. I desperately needed some more sleep. Finally, after waking up I did a brief list of what needed to be done: SFX, design some levels, build the different menus, put a timer on screen, design some enemies… Ease, isn’t it? It turns out that the first day I was able to lay some groundwork but there was still a lot of work to do. In the end, I managed to do proper work on enemies and decent work on the menus and the timer. On the other hand, I ended up not working on sound effects and just built 3 levels mindlessly (which, to add insult to injury, I didn’t have time to playtest). A couple of last-minute additions (and when I say last-minute, I mean I thought about it and rush-built it) where the Arena mode, which I think suits better this type of game than the levels, and crates with a health refill and a triple-shot power-up, which I also think fit really well with the kind of game I made. Not being too focused on pursuing just one goal and allow me some wiggle room. Essentially, I will focus on another aspect of the game when I am too tired or bored of doing something (i.e. I have been coding for several hours and I start getting tired. When I wrap up the section I am working on, I might go an work on the art or the music, just to have a change of pace.) This is a philosophy I adopted the second day of the past Ludum Dare and I think it is positive for my mental sanity, avoid burnout and allows me to come back with fresh eyes. I am quite proud of the background music. It is the first time I attempted to compose something that long and I must say I am OK with what came out. I could refine the bass in some segments and have more rhythmic variation on the drums, but I am happy enough with it. To be honest, the song was the last thing I did on the first day after several hours of working in Barreus and when I listened to the song again on the second day, I was quite proud (It wouldn’t be the first time that something I did while being immensely tired turned out to be rubbish on a second inspection). Apart from the obvious: Design, art, animation, programming, music,… which is pretty much every skill related to making a game, I think I should do a better job on planning what I want the finished game to be and what are the goals I need to accomplish. With the pressure of the 48 hours, I get too impatient about doing some “real work” and I skipped most of the preparation to get the feeling that one is doing something tangible. I knew I needed to build a character and get him to move, so I dove right into that when I should have fleshed out more about my vision for the project and this ultimately showed at the end when I had to rush the design for the levels and they don’t present a good difficulty curve. In hindsight, it would have been much more effective to focus on building a good arena experience (I think the idea of the game fits better this kind of game mode as  it tends to have a level filled with enemies and lets the player enjoy the shooting and  it is less design heavy) and just build a handful of levels to be used as tutorials. It turns out that most of the bugs that appeared after submission did not seem complicated to offer some workaround to improve the player’s experience without doing any major changes to the game. Ironically, this comes to show that I should definitely leave some time to test the game before the deadline. I decided to upload the version 1.01 that solved a bug that didn’t allow the player to progress through the levels as the corrected LD40 entry but not the v1.02 that addressed the jumping issue because this impacts directly the user’s experience but it is not game breaking.